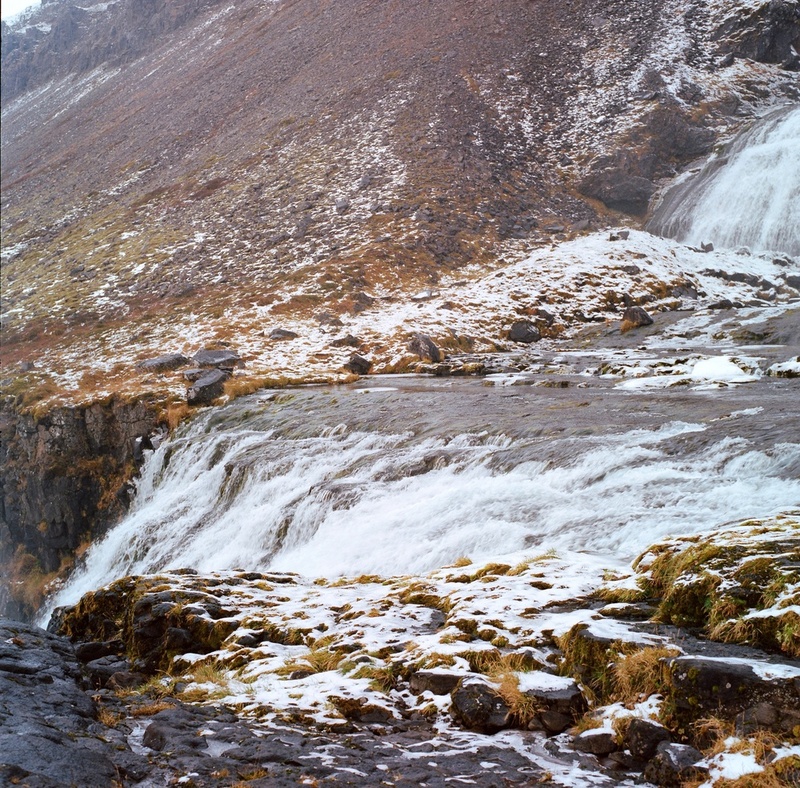 Dynjandi is the most stunning waterfall in the West Fjords, and is alone worth the sometimes treacherous drive into that part of the country. 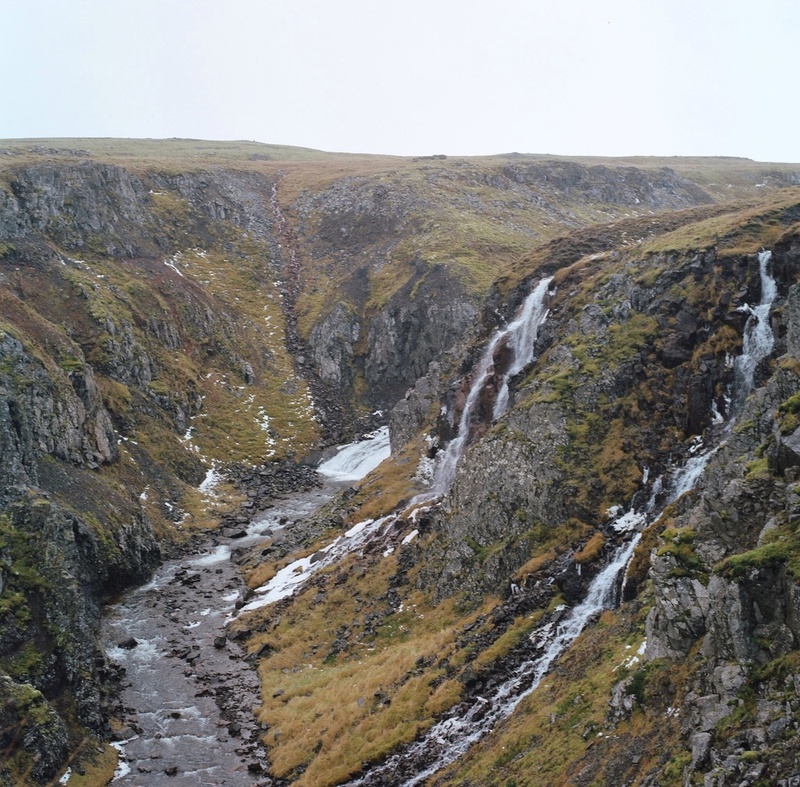 Its name means "thunderous," which it truly is, and it's made up of 7 falls, the huge one at the top, twice its width at the bottom than where it begins, and the six smaller ones that dance their way across the landscape into the fjord below. 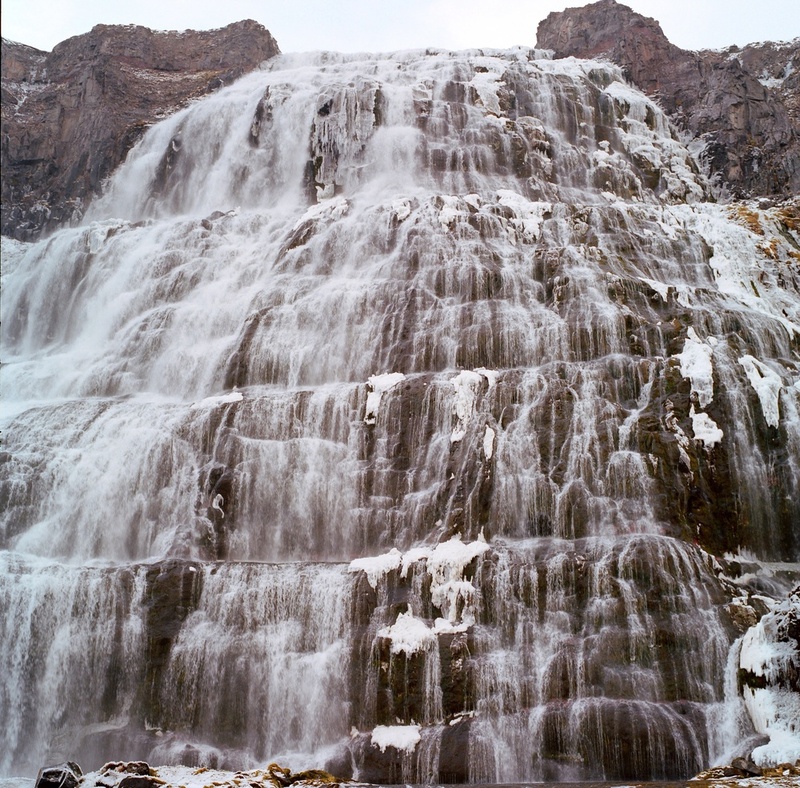 Hiking up to Dynjandi is breathtaking, passing one pretty fall after another, moving past brightly colored flora and bubbles then walls of ice, ending in the climax of standing before the massive face of cascading water, the mist leaving fine drops all over your face, hair, and clothing. By far my favorite moment (moments? hours?) though, was finding a spongy patch of earth to lay down in, shutting my eyes, and letting myself be enveloped by the deafening noise of thundering water. Lying there in the white sound with the ground cushioning my body, no part of earth or limb resisting each other, it was easy to imagine myself being swallowed up by this place and staying for as long as it existed. I could understand all of the Icelanders that stories told of making last pilgrimages in order to have their dying bodies disappear into mountainsides, their life force dissolving seamlessly into the quiet unquiet, a continuous flowing of water from cliff tops to the ocean, the movement of moss creeping over volcanic stone. Perhaps it is everywhere on water and on land." Driving into the West Fjords. 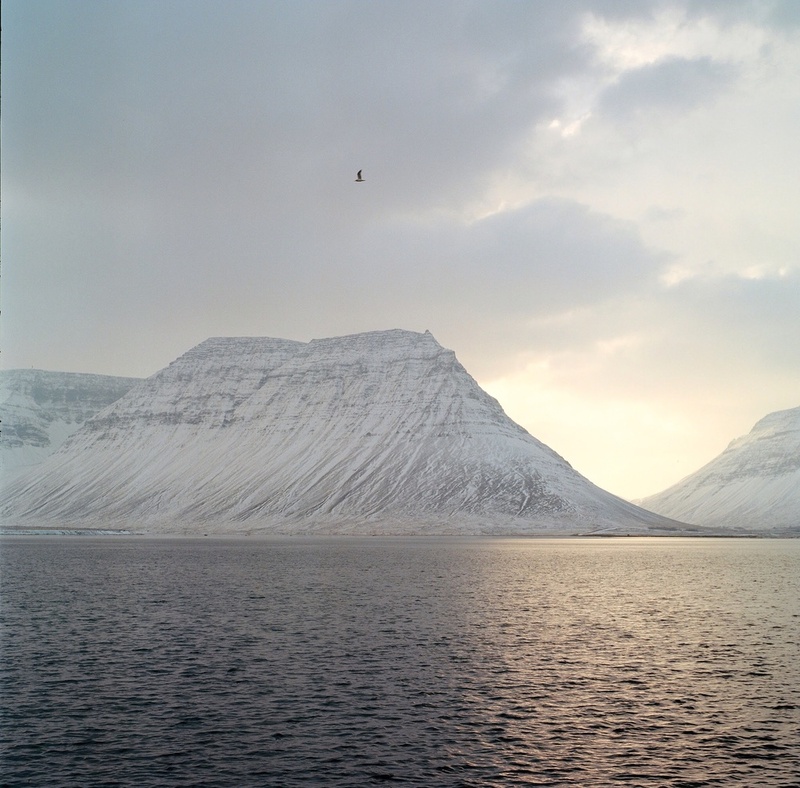 The West Fjords of Iceland are rarely visited due to the rugged landscape, frequent rough weather, and unkept roads. However, they're one of the most breathtaking areas of the country, often said to have landscapes representative of all the other areas of Iceland on just the peninsula itself. And it's true. One minute you'll be in the middle of a desolate, snowy flatness that seems to extend forever, only to turn a couple corners and see jagged mountains tumbling down into glassy, still water. Filled with contrasts and surprises, this was one of the most surreal places in Iceland for me. One of a million roadside waterfalls. I don't have an actual photograph from this night, but it's one that I need to remember. An empty hostel, isolated in the middle of nowhere northern Iceland, that I'd chosen for the two naturally heated pools that I'd read were just a few hundred feet behind the hostel on the edge of the ocean. Four hours that felt like four minutes spent in those pools, waves softly splashing a few feet away in the darkness. The northern lights, my first time, suddenly brightening in the sky and then dancing overhead in waving sheets of greens and purples. Electric energy humming just beneath my skin as the universe started pulling me back to myself and I could do nothing but watch in stunned silence. No sense of time, finally scooping up my clothes and shoes and running through the snow back toward the hostel, the cold like needles on my feet. And then, warmth, underneath a nightlight in my little bed pushed against the wall by the window. A moon waned to crescent. While driving out of Snæfellsnes, I backtracked a little past the Deildartunguhver hot spring to visit Barnafoss, a waterfall I hadn't had time to see before dark after hiking Glymur. Translated to "children's waterfall," there's a legend that a natural stone bridge used to span the river here. One day, two children who were supposed to be at home one winter evening got bored and went exploring. When their parents got home and found the children missing, they traced their footprints to where they ended in the middle of the stone bridge. Realizing that the children must have drowned, their mother put a curse on the bridge, causing an earthquake that made it crumble into the river below. While I don't know about that, I do know that its milky water is the bluest I've ever seen. Some days seemed to be entirely spent pulling the car over to the side of the road and wandering. Since it had been too stormy to see this glacier-topped volcano from the south of the peninsula, I decided to approach it from the north the next day. The mountain is believed to be a major source of energy and power, and is the entrance point in Jules Verne's Journey to the Center of the Earth. It was one of the things I most wanted to see in Iceland, and I couldn't believe the dreamy view I got.